Once a year, during the fall in Munich, Germany, the country known for its appreciation for fine, hand crafted beers, celebrates Oktoberfest. 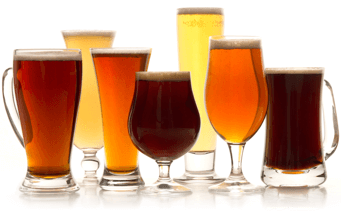 The beer traditionally consumed is copper in color, malty in flavor and aroma, and easily drinkable. Frankenmuth's Oktoberfest is brewed in the same tradition using 85% 2-row pale malts and the remaining malts a 15% combination of Munich and Caramel. Cluster hops are added at the beginning of the 90 min. boil to add a slight bitterness to the beer while Perle hops are added 15 min. before the end of the boil for their aromatic contributions. Look for a light copper color in this filtered, medium-bodied beer. Notice a predominately malty nose which has a slight hop bitterness true to style. Frankenmuth's Oktoberfest offers a caramelly and slightly roasted flavor up front which is dry in the middle and finish. Overall, a fine interpretation of an Oktoberfest from a stellar brewery. Frankenmuth, MI, which is known as "Michigan's Little Bavaria", is located on the Cass River in a wide expanse of fertile rolling farmland called the Saginaw Valley and was founded in 1845 by German immigrants from the Bavarian region of Franconia. The Brewery itself was rebuilt in 1988 after a devastating fire and has been operated by the Heine family since 1991. Frankenmuth uses a115 barrel gas fired copper kettle which allows for fire brewing their award-winning beers. 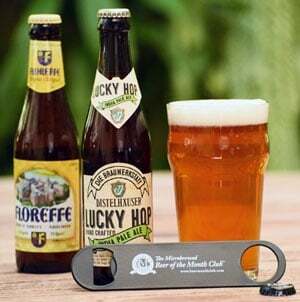 Their primary product line which includes, a German-style pilsener, dark and light lager, bock, weisse, oktoberfest, amber ale, and red lager, has received 20 varied accolades in the last five years alone. Our panel considers the brewery to be a prime candidate for featuring one exceptional brewery's entire product line down the road. Brewmaster, Fred Scheer, has worked in the brewing industry for 23 years in German, Dutch, and American breweries, has a master's degree in Brewing and Malting Science, and is a current active professional American Homebrewing Association judge acting on the Great American Beer Festival's evaluation panel. The brewery employees 14 full-time employees and offers hourly tours 7 days a week.